The vehicle prompted a major emergency services response, with police, firefighters, and paramedics all showing up at the scene, close to the Don Valley Parkway. They arrived to find the gutted car with no engine, no passengers inside and the area cordoned off by yellow tape, not put there by police. Kwong said he called 911 out of concern for public safety. The area underneath the car includes hiking trails popular with dog walkers, he noted. Around 8 a.m. 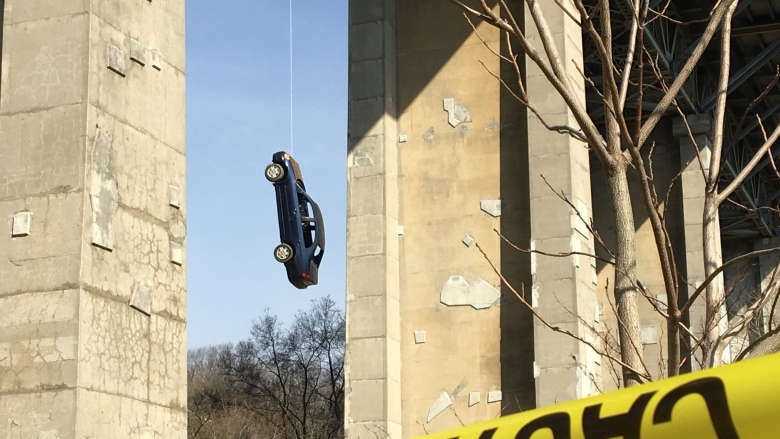 ET, police believed they'd solved the mystery, tweeting that the car was part of a movie shoot. They walked that theory back a few minutes later, saying there was no shoot authorized or confirmed, leaving Torontonians wondering who would have taken the time to suspend the car, which had no licence plate.